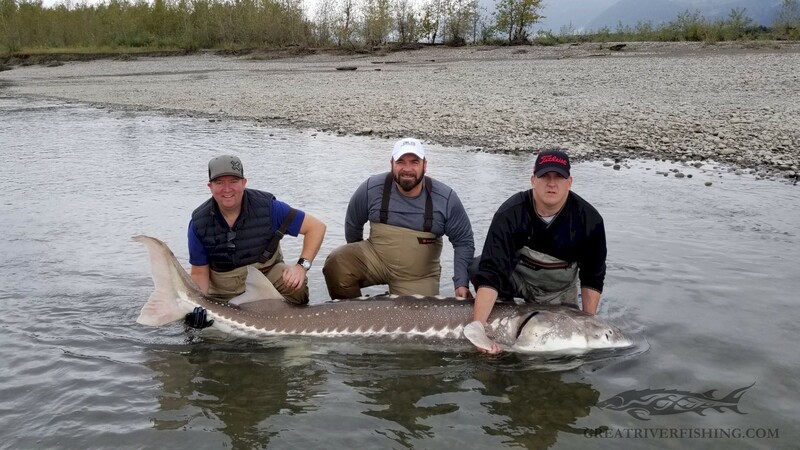 The 7th Annual Duck’s Unlimited Sturgeon Classic Fundraiser was held last weekend here in Chilliwack and a grand time was had by all participants. 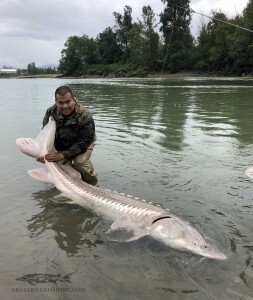 Sean O’Donavana (pictured below), along with guide Landon Gill, landed the largest sturgeon of the fundraiser, a 9 foot monster with an estimated weight of 480 pounds!! This fish, as well many other awesome specimens, were caught during this 2 day event which raises awareness and funds to help support wetlands through the efforts of Duck’s Unlimited Canada. GRFA is a proud sponsor of this fundraiser along with many other local Chilliwack businesses and individuals. Our thanks go out to all the businesses and volunteers that made this year such a fantastic success. 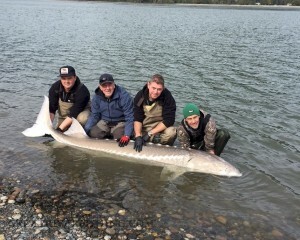 Although it can be a little to day to day the sturgeon fishing has been very consistent lately. With the end of the sockeye near, sturgeon have been very much fattening up for the winter and you can really tell, most of them look like butterballs and are very girthy… almost all fish are 10 to 20 percent heavier than a month ago!! Good size average and decent numbers have been the norm lately. 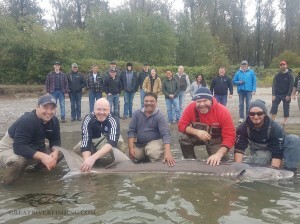 Sturgeon have been primarily targeting salmon in the river. 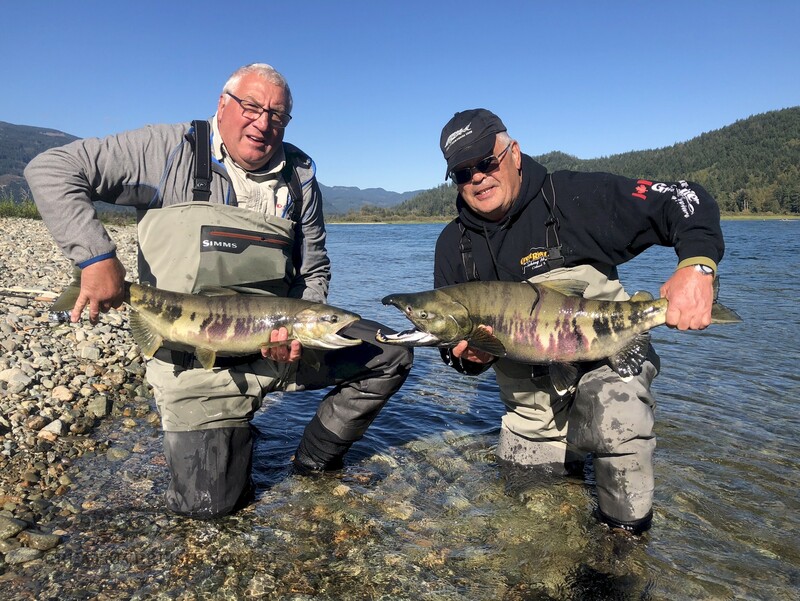 At the moment sockeye parts are definitely working best however in another week or two they should really start switching over to Chum salmon as there are plenty in the river already and the sockeye will be through very soon. Fish have been stacking up in the deeper holes and if you find a few, stick around, there’s bound to be more. Some guides have been doing very well fishing the shallower edges of the holes, especially for larger specimens. The river is very low and one really needs to be careful out there right now, we have seen a few boats high and dry on the gravel bars. Of particular note the old Five Fingers stretch of river (Wellington Bar to Bowmans Bar) is very touchy and a prop driven boat should steer clear of this area. Definitely want to keep an eye out for shallow bars and watch your sounders as your running even in a jet boat. 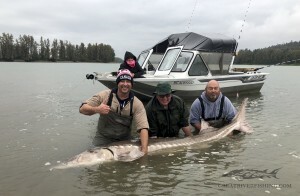 What better way is there to spend a warm autumn day than sitting in a comfortable covered jet boat waiting on another bite from the almighty sturgeon. With limited fishing pressure on the river this is a great time of year to get out and experience these dinosaurs of the deep. We offer half and full day outing’s via jet boat with nothing but the finest in guides and tackle. We pride ourselves in ensuring your day is as comfortable, safe and enjoyable as possible. Whatever your speed, we will cater to your needs. Call or email today. 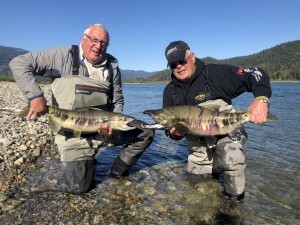 The Fraser is officially closed to salmon fishing from the Alexander Bridge to the Mission Railway Bridge until the 25th of October. This measure was put in place to protect migrating interior steelhead, ie Thompson and Chilcotin Steelhead stocks, which are currently believed to be at dangerously low levels. We all need to do our part in protecting this fragile fishery and understand that conservation must be at the fore front of our way of thinking. Do not despair! 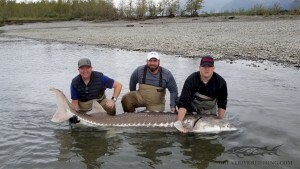 Other opportunities for salmon still abound locally. 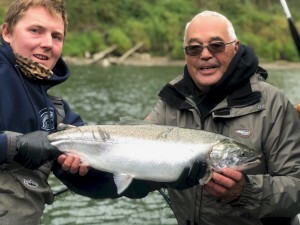 In fact all other rivers remain open including the Harrison, Vedder, and Stave which are all experiencing very good returns of fish at the moment. 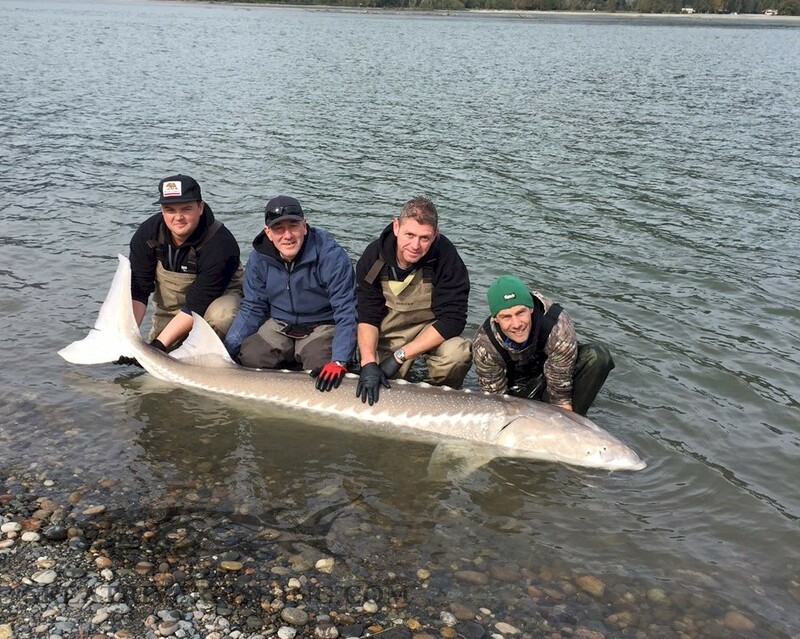 Please consult your fishing regulations for specific quota’s and openings. 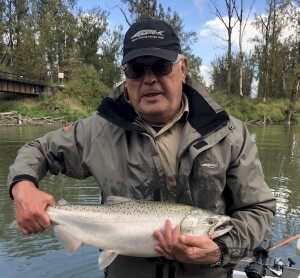 The Harrison has seen a decent push of both chum and coho over the last week with the fishing only getting better daily. This is early for the Harrison and bodes well for the next few weeks. Most anglers are float fishing jigs with bait, spoons/spinners and flies, both single hand and spey. The Vedder is very low but producing fish nicely throughout the river during low light conditions float fishing roe, jigs, wool combo’s and spinners. With the low water the mouth has been producing well on the slack tides with anglers working spoons and spinners. 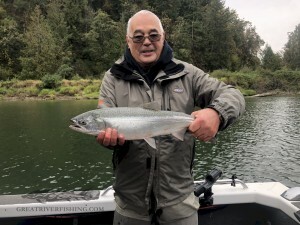 The Stave has some chum around and has seen some decent pushes of coho of late as well. Coho have been primarily caught from boats in the lower river using spinners, spoons and flies. 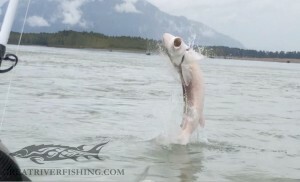 Chum are getting taken by the usual means of float fishing for them in the upper river closer to the dam.